There are a bunch of great rotary speaker simulators on the market, but the Lester G is the most convincing example we've given a spin for a long time. Great bottom-end. Superb sound emulation. Leslie rotating speakers were designed for use with Hammond organs, until The Beatles had the bright idea of using one to amplify guitars. 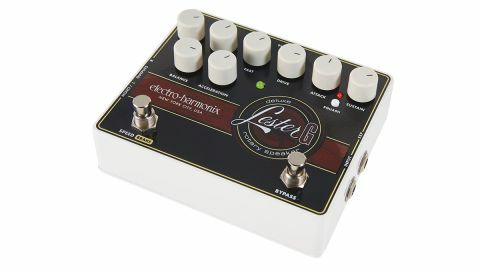 The EHX Lester G Deluxe Rotary Speaker pedal captures that classic swirling phase sound of a Leslie, as immortalised on the spooky intro riff to Soundgarden's Black Hole Sun, among others. Leslie cabs have two speakers, offering bottom-end grunt from a woofer that feeds a rotating drum and top-end from a horn that physically spins. The Lester G's balance control lets you sweep between emulations of those two sounds, and you can set the maximum and minimum speeds that the pedal's virtual drum and treble horn rotate at. Stepping on the speed/brake switch increases and decreases the rate that the 'speakers' spin. Sounds tricky, but the bottom line is the Lester G nails the effect perfectly. What makes it even more lovable is the onboard compressor and drive circuitry. You can get the Lester K Stereo Rotary Speaker (£139) without these features, but they're a big part of the authentic Leslie sound. The 'squash' compression setting is worth the extra outlay on its own.